Design studio March Gut has converted a wine cellar in northern Austria into a tavern, with stepped seating on the roof to allow customers to get a better view of the surrounding vineyards (+ slideshow). 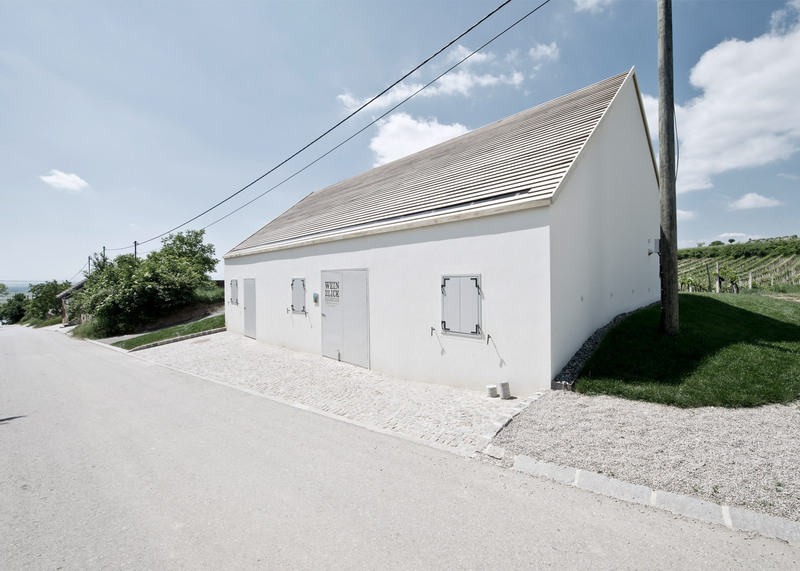 The Linz-based studio, led by industrial designers Christoph March and Marek Gut, was asked to convert the old cellar into a wine shop and tasting venue for the Franz Anton Mayer vineyard. Their largest intervention was to add terraced seating made from white-painted steel to one side of the pitched roof, offering scenic views of rows of grape vines. They then named the project Weinblick, which translates as "wine view". "The idea was to create a outlook over the grapes that are actually out of sight from the street," the designers told Dezeen. "The formerly simple architecture of the building was radically changed," they added. 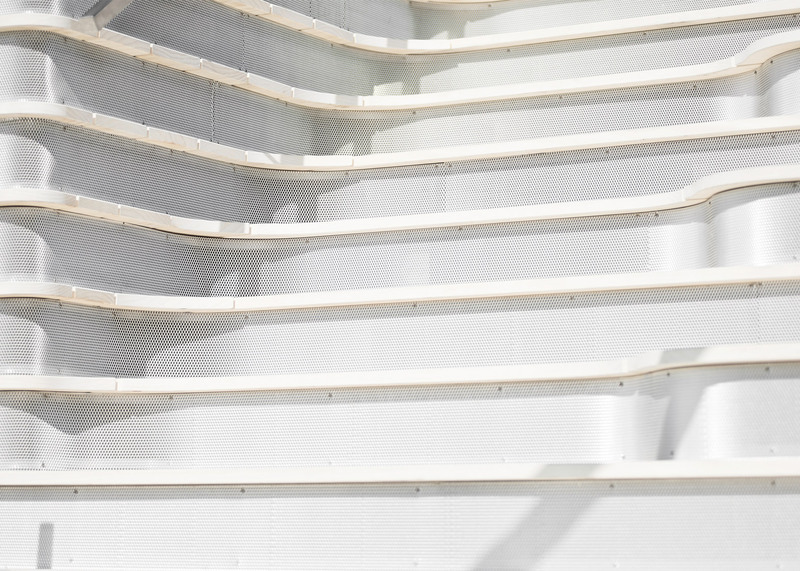 "A landscape of seating steps offers the perfect place to look out into the vineyards and inspired the name for the project." The steps continue inside the building, where a black metal staircase with integrated wine storage leads to a tasting space, shop and cellar. A house-shaped shelving unit is fitted into one end of the space and used to display wine bottles. A deep recess in the wooden shelves allow natural light from a window to filter into the interior, which is furnished with pale timber furniture for wine-tasting events. "In our approach to the design of the wine tavern, we focused on the themes of wine tasting and lingering," said March Gut. Steps continue down into an original tunnel-like cellar made from loess clay – a material derived from a silt-sized sediment, formed by the accumulation of wind-blown dust. 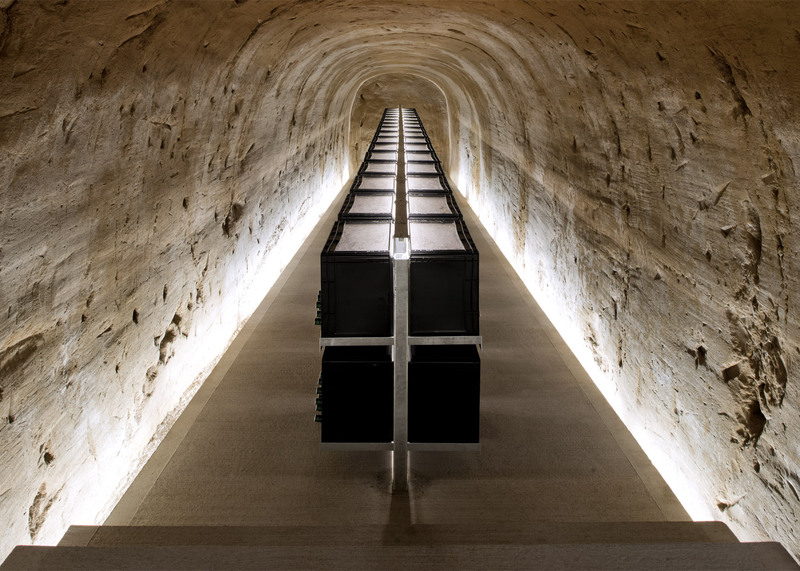 Here, wine bottles are stored in a simple row of black translucent boxes. "The loess clay typical for this region was left in its unfinished state – the cellar offers an insight into the ground soil and the deeply rooted grapevines," said the team. 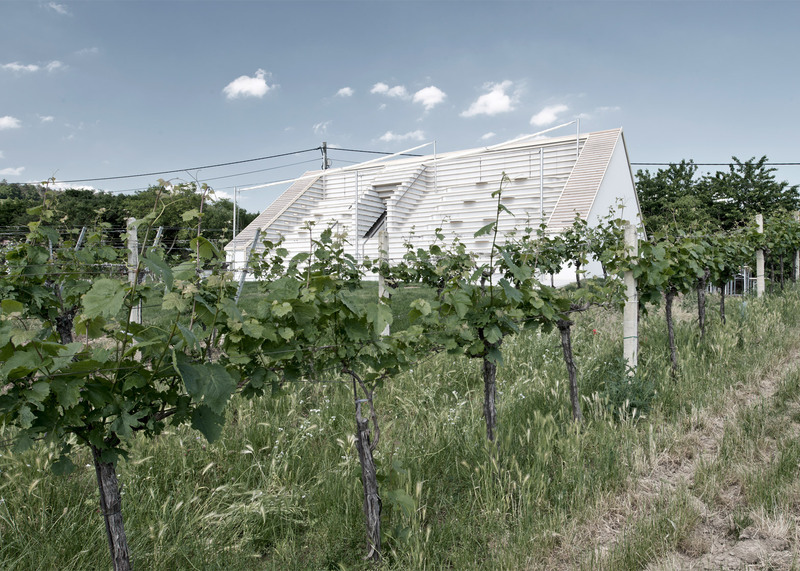 "The production character of a vineyard is highlighted by the rather raw materials like steel, cement, and cluster pine, which conjoin the new architecture with the old remainders of the building." Architects Elmar Ludescher and Philip Lutz added a wine-tasting venue to another Austrian vineyard. The three-pronged and gabled building forms a courtyard at the centre of the 50-year-old Högl winery in Lower Austria. Other architects including Foster + Partners and Jean Nouvel have also extended estates in France, while new buildings have also been added to the Cloudy Bay winery in New Zealand and the Bodegas Protos winery in Spain.